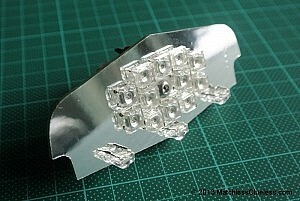 Home > My Matchless motorbike blog > LED lighting > New 6-volt Lucas 564 LED boards available soon! After a long wait, the new Matchless Clueless six volt LED light boards for the popular Lucas 564 style rear lamps will be ready to ship soon! The 6v version of the light board has been on backorder for the last year or so whilst the circuit board has been completely redesigned to bring it up to the same standard and performance as the best selling 12v version. The circuitry is a little more complicated on the 6v model because there are less volts to play with for powering the LEDs so, combined with the need to complete other projects first, development of the new LED boards have taken much longer than expected. The new circuit boards are currently being manufactured and should be completed by the end of the month (March 2015). They will then be assembled and thoroughly tested, hopefully being ready to ship be the start of April. Those of you who already have a backorder for a 6v unit will be the first to receive one of the new boards – expect to have this arrive on your doorstep in early April. For those of you who haven’t yet placed your order then it would be wise to do so soon as stocks of the initial production run will be limited. There is also a backorder discount available at the moment which makes these new LED boards even more of a bargain! Unlike most off-the-shelf LEDs, the MatchlessClueless LED light boards are suitable for both positive and negative earth bikes with special in-built polarity correction and protection circuitry. 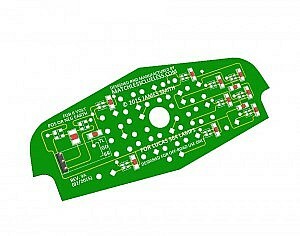 See here to order your 6v Lucas 564 LED light board. The photo above shows a 3D computer generated image of the new LED circuit boards. The finished boards will actually look pretty identical to the latest 12 volt version of the board with the same high quality reflective silver coating to maximise the brightness and visibility of the Lucas rear lamp. Installation is also completely plug-and-play, just like the 12 volt version (see installation instructions here) and is as simple as changing the bulb. Absolutely no modification of the rear lamp unit or the wiring is necessary as the LED board plugs into the standard bulb socket. These really are the brightest, most visible, lowest power consumption and generally all round best LED lighting option available for 6 volt bikes using the Lucas 564 rear lamp, so order yours today! One Response to New 6-volt Lucas 564 LED boards available soon!